No proof of Marcos Plunder? Bongbong Marcos did not know of the massive plundered loot of his family? Read the Supreme Court cases to learn of their massive plundered loot! In “Ferdinand Marcos, Jr. vs. Republic of the Philippines”, G.R. No. 189434, April 25, 2012, you will learn that the Marcos children, including Bongbong Marcos, signed several Compromise Agreements with the PCGG all dated 28 December 1993 where they admitted holding US$356 million in Swiss accounts which the Swiss government eventually ruled to be ill-gotten. However, when the Republic of the Philippines filed on 18 October 1996 to forfeit the $356 million, true to form, sneaky Imelda Marcos disowned the Compromise Agreements claiming she was not a party to it. More importantly, she admitted that she owned 90% of the funds while the remaining 10% belonged to the Marcos estate. A damning admission of ownership of the unbelievable amount of US$356 million. This is a clear admission of the Marcoses’ ill-gotten wealth especially since in an earlier case, Ferdinand Marcos Jr. v. Republic of the Philippines, G.R. No. 152154, July 15, 2003, the Supreme Court found that based on the admission of the Marcoses, the combined accumulated salaries of Marcos and Imelda from 1966 to 1985 was only P1,570,000 and P718,750, respectively, or a total of P2,288,750. Unrepentant Plunderers! The Marcoses have no shame. They lie to our faces, use the very same plundered funds to pay off trolls, loyalists, pr men to spin their web of lies! 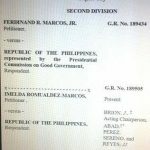 The US Court of Appeals on Wednesday wrote that the “$100,000 per day amount was necessary and appropriate because the Marcoses’ contumacious conduct” caused direct harm to the victims, by preventing them from collecting on their $2 billion judgment.